I’ve long worked with FPDF which is very light (with a core file of 49ko), easy to implement but the functions provided are limited. TCPDF first astonished me since it is able to display pure HTML in a pdf file (tables, css,… support). It also provides transformation functions that allow you to display text vertically on a .pdf file, for example. But the TCPDF core file is much too heavy : 963 ko. I run AJAX scripts that load that library at each AJAX call, which makes the time waiting for the .pdf files to be ready much too long. So, I’ve tried to make that class lighter and got rid of all comments it contained. But I still had more than 500ko of file. I then decided to go back to FPDF and found an extension class that allows FPDF to rotate text on a page. This tutorial is devoted to implementing FPDF (and rotation class) in PHP framework Codeigniter 2.0.3. Be careful when creating those two libraries in Codeigniter to follow Codeigniter’s tips on creating libraries. You’ll find the files attached to the bottom of this tutorial. In doing so, you’ll activate Apache Mod_rewrite and be able to load http://localhost:8888/codeigniter/index.php/welcome via http://localhost:8888/codeigniter/welcome. and change the values to suit your own configuration. The Html form we will create is rather easy. 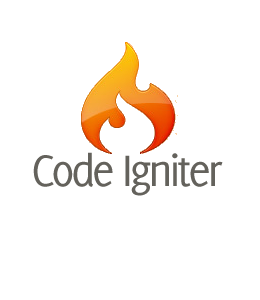 Codeigniter is made of core libraries and helpers that you’ll find in the /system/ directory. We’ve autoloaded the form helper to help us build our form. As you can see, the form helper is here at work with methods like ‘form_open()’, ‘form_close()’ that will automatically generate <form> and </form> tags. The “Message” div will be used to display the Ajax Response. The Html form is now ready but we still need to build the controller class that will load that view. The constructor of this controller loads the form_validation library which we will use to check the content of the posted fields. 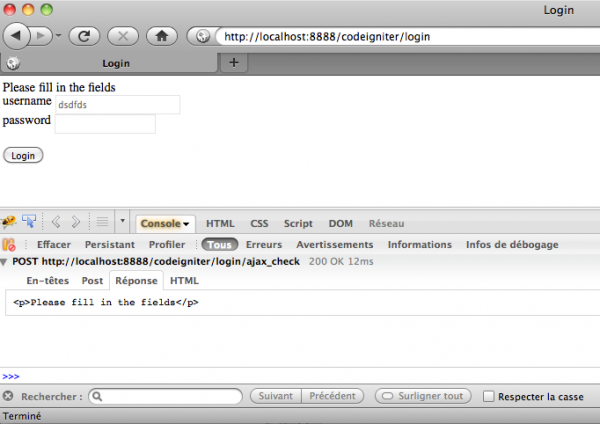 We’ll also use the url helper to build the url of the form action attribute. Let’s go back to our /views/v_login.php. The script will be triggered once the submit button is hit : $(‘#submit’).click : the # sign identifies the “id” attribute of an element of the page (the submit button in this case). Then we store the posted variables (username and password) in the form_data array. This array also contains the “ajax” key with value “1″. This value will be checked in the controller. success : what the script must do if the request is successful : the controller will return a piece of text that will be displayed in the $(‘#message’) div. return : false; is used to prevent the script from actually reaching the form action url through http when the submit button is clicked. We will then create a second controller method called ajax_check() to check the variables posted through Ajax. The script checks if the ajax variable posted equals to “1″. If so, we use the Codeigniter form_validation library to check the required fields and echo the validation errors if necessary. We’ve loaded a model called m_access, then we call the method check_user and send it the username and password variables.